If I had to pin point the release of the beauty product which has got me the most excited during the whole of 2011, I would say, without a doubt, that it was the release of the very first bb cream in England. Little that I knew that just before the year ends, in November, that the hype around a certain 'miracle' product was going to fascinate me like never before. The miracle it promised? To look ten years younger in 40 seconds. 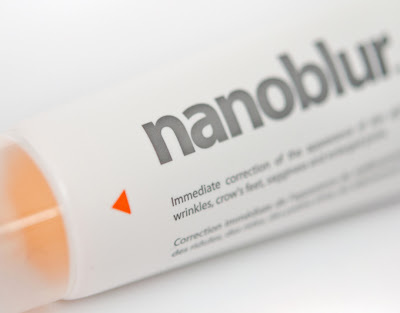 You have guessed it: I am talking about the one and only Nanoblur Optical Skin Cream. Would have I read about it first on a shopping channel I wouldn't have battled an eyelid. The launch of Nanoblur happened in some swanky club (the Box I believe) in London, where people were not even allowed to take photos, which made my curiosity go even wilder. 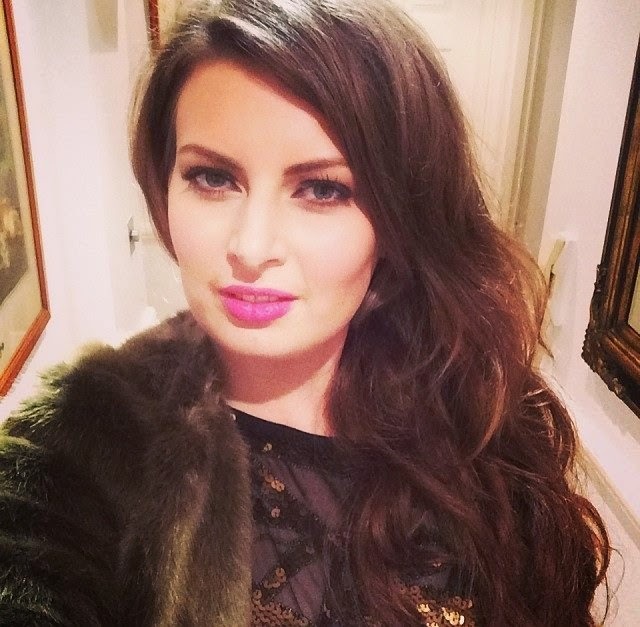 Then, there was such a buzz from the attendees, from your normal girl next door to bloggers and magazines all raving about it that I just had to figure out for myself whether it would work for me and whether it could make me younger, as it claims to say. Those of you who already know about Nanoblur are more than welcome to skip the following paragraph but I felt I couldn't share my experiences with the product without talking a little bit about the design, meaning behind the name and claims of the product. Nanoblur was created by Indeed Laboratories in Canada. It's an advanced optical cream which aims to reduce the appearance of skin ageing, lines, wrinkles, sagginess, crow's feet and enlarged pores within seconds (40 to be precise) The product doesn't aim to treat your wrinkles and improve them over time, and it's not makeup. 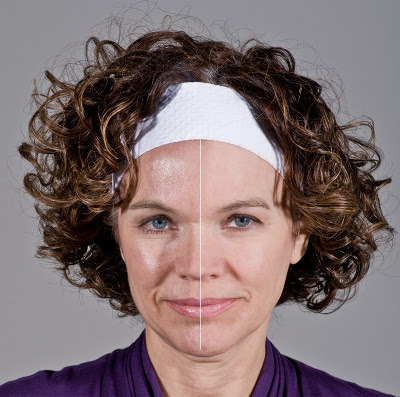 All it claims to do is provide superficial coverage of skin imperfections (wrinkles, fine lines, enlarged pores) or to provide an optical illusion that your imperfections have been improved. Why the name of nanoblur? The cream is full of tiny, minute, micro high-tech elements/particles which scatter light onto the skin, to trick the eye into thinking that your imperfections have been ironed out. The particles are so small, they are on the nano scale (700 nanometres) hence the name of 'nanoblur'. Yes, that’s why those tiny ipods were called ‘ipod nano’. To be honest, would have the name of 'micro blur' been as catchy? I am not sure, as I am sure it could have been interpreted by some as a product who can only make a small/micro difference to the appearance of imperfections. Nanoblur or Microblur, I just couldn't wait to try to the product. A product which received amazing rave around its launch, claiming to make me look 10 years in seconds and at only £20 the pot? Hell yeah I wanted to try it as soon as possible and see what it could do for me. I first applied the product on my hand and wanted to see how it performed. I just couldn't believe my eyes. Within seconds, I could really see where the cream had been applied, revealing a stripe of skin dramatically smoother. Not only did it *feel* smoother, like you would get when you would apply a good primer but it *looked* dramatically smoother, living up to its name and blurring the definition of all the little lines on my hand. I also noticed that the stripe of skin where I applied the nanoblur looked incredibly mattified. With the same fascination you would have when trying your first crackle polish, I then proceeded to apply nanoblur under my eyes which is my main area of concern. I was gobsmacked. Within seconds, like it did on my hands, I really could see a dramatic result: My lines instantly appeared much much much less noticeable whether I stood still or I smiled. I squealed with joy. I have purchased a fair few wrinkle fillers / line eraser products in my life but none of them has given me such a result before. I was blown away. So that's it? You should all go and buy it? Well.. not quite. There is one limitation to this product. A big one. While I could happily go out with my freshly nanoblurred hands out in the big wide world and nothing else, the chances of me stepping out the house wearing just a moisturiser on my face and Nanoblur on top are about 0.2%. Then comes the issue of applying Nanoblur in conjunction of makeup and you are faced with a few dilemmas. Applying it after you've done your makeup, on top of your foundation and disaster strikes: It makes a mess of most types of liquid/cream foundations, dragging your foundation all over the place and making you look worse than you started off. Apparently it works with mineral powder foundations and Chanel/Dior whatsit. Well I am not interested in that. What I am wearing is your average Revlon foundation, and that's the foundation I want it to work with. Applying it before your foundation and you lose some of the blurring wonder power that Nanoblur can do for you. I have found a method to wear Nanoblur on top of any foundation which doesn't make my foundation separate: it's to gently tap the product rather than sweeping it across your face but this in turn causes a problem: as the Nanoblur dries, you really feel the Nanoblur stays there on top of your skin, a bit sticky almost. Do you know the feeling when you've just had your top lip waxed and it feels a bit numb/weird? this is what Nanoblur feels like on top of my foundation. Then I began to wonder: What if the blurring effect was 'simply' achieved by the mattifying effect of the cream. After all, when you apply eyeshadows for example, you use a matte texture to make a prominent area less noticeable/recede and shine/shimmer to draw attention to it no? So I applied a mattifiying primer (cheapo from Rimmel) on my hand and around the eyes (on bare skin) to see if I could achieve the same effect. The Rimmel mattifying primer didn't even come close to Nanoblur and did no effect whatsoever on my wrinkles. There is definitely more to Nanoblur than mattifying your skin to improve the look of your wrinkles and imperfections. Yes, it does, without a shadow of a doubt and I have never come across a product which does such a fab job on my wrinkles! But the product comes with its limitations and I am already ready for Nanoblur 2.0 or second generation. 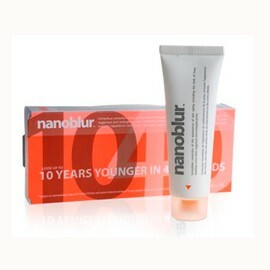 DOES NANOBLUR MAKE ME 10 YEARS YOUNGER? As if. Of course not. The statement of 'looking 10 years younger' is a very subjective one anyway. A trendier haircut, whiter teeth, having my make up professionally applied could take off years off my overall appearance and didn't even touch on the features on my face which are ageing me (droopy lid, loss of volume in the cheeks, in the tear trough area, naso-labial lines etc). In fact, most people wouldn’t even recognise the difference. I do. I know my wrinkles by heart, I look at them every waking minute of my day, I can see when they are smoother and less noticeable. Your colleague / friend / partner / dog doesn’t have a fixation on your wrinkles, so they probably won’t notice the difference. Also, if not careful, and applied on the whole face, some people might feel even older, as the mattifying effect could remove your natural glow, which is associated with a more youthful appearance. I was lucky. My friend offered me the possibility to try Nanoblur for free, in exchange of a guest feature on her blog and sharing my experiences of Nanoblur with you, dear readers of perfectlypolished. Nanoblur is not perfect, I wish it was easier to use it in conjunction with makeup. But I am absolutely thrilled that such a product, exists despite its limitation (Nanoblur is NOT A PRIMER, it’s a ‘FINISHER’ so, in my opinion, if you don’t apply as the last step of your makeup routine, you’re not getting the best results) you bet I will be repurchasing when my tube runs out. Nanoblur is sold exclusively in Boots and retails at £19.99. A little bird told me that the little monkey from buyapowa.com will be relisting the product soon, which means it will probably be half price again. Next, I also want to try ‘Freezeframe’ but the price tag of £50 puts me off a little. Any of you tried Nanoblur? The before and after promo picture they released for it is definately too good to be true, which I think sums this product up. IMO It's not worth the £20 price tag when the product doesn't really work underneath make up. I'm unsure and think that it would be safer to invest in a good primer than nanoblur. I tried Nanoblur, but since I don't have lots of wrinkles, cannot see the diffference. Indeed lab will release a new product soon that is already out in Canada, you might want to check it out! So what you are saying is that for a guy, who doesn't wear make up, and wants to appear a little more wrinkle free on certain occasions, this is the trick? Thanks for a great review! I've just tried this and agree that it does have an effect, but have not tried on top of make up yet, so thanks for the tips! I use it on top of my Skin79 BB cream, which is kind of waterproof, and the Nanoblur goes over that like a dream.